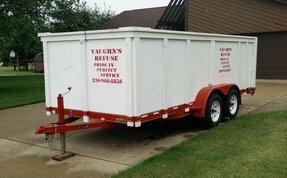 At Vaughn's Refuse we take Pride in Perfect Service . We provide service in Stark County and most surrounding areas. 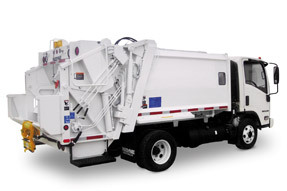 Vaughn's is fully equipped to handle your jobsite or residential trash removal needs. Please review the services we offer and give us a call to let us know how we can help you. Vaughn's takes great pride in the service we provide for our customers. Whether it's quickly signing a homeowner up for new service or helping our contractors keep their schedule we always accommodate our customers' needs. We offer homeowners a variety of options for curbside pick-up from weekly or bi-monthly to monthly. If you are unable, too busy or prohibited from bringing your trash to the curb simply leave it by the garage door with our carryout service. Our jobsite rubber tire dumpsters can be filled to 7, 10, 15 or 20 cubic yards. These portable wheeled dumpsters are easier on driveways than most other options. They can be placed in the yard and more easily moved than a traditional dumpster. The dumpsters are a great option for contractors as well as homeowners for a garage or basement clean out. Contact us today and let us know how we can help you. Servicing most of Stark County and surrounding areas.